If you’ve been searching high and low for information on how to feel good about yourself, you may have been looking in all the wrong places. Your self-worth is definitely important in the scheme of things. The way you feel about yourself shapes your life, so it would make sense that we’d want to build as much self-esteem as possible; right? Not so fast. Yes it’s important not to get caught up in the negative thoughts that are generated by your inner critic. But at the same time you don’t need to go overboard either. These statements seem pretty benign if not helpful, but think about it: if every child is brought up to believe they are special, then what happens when they get out into the real world? Let’s face facts: not everybody can be special because being special, by definition, means standing out from the crowd. So instead we end up with a whole bunch of young adults (think generation Y), who have grossly unrealistic expectations of what the world has to offer them. They flounder in a world that offers nothing but disappointment since they’ve built up such high expectations they can’t help but be deflated when they discover that they’re going to have to work at McDonalds for a little while longer before they can become Prime Minister. Imagine being brought up thinking you’re ‘it and a bit’ only to find out everyone else around you is also’ it and a bit’? You’d have to indulge in some extremely narcissistic behaviour to overcome this unwanted feeling of mediocrity. I’m not knocking the concept of confidence; but when you focus solely on this aspect then the way you feel about yourself becomes not about being comfortable with who you are EXACTLY as you are, but about what you have to be, do or have in order to stand out from the crowd. When this happens you’re looking outside yourself to feel okay, which means you’re ultimately setting yourself up for a fall. What About Being Kind To Yourself? A more sensible approach is to cultivate self-compassion, which has nothing to do with evaluating yourself and your achievements. You’re kind to yourself just because….no matter how pretty, smart or successful you are (or aren’t). 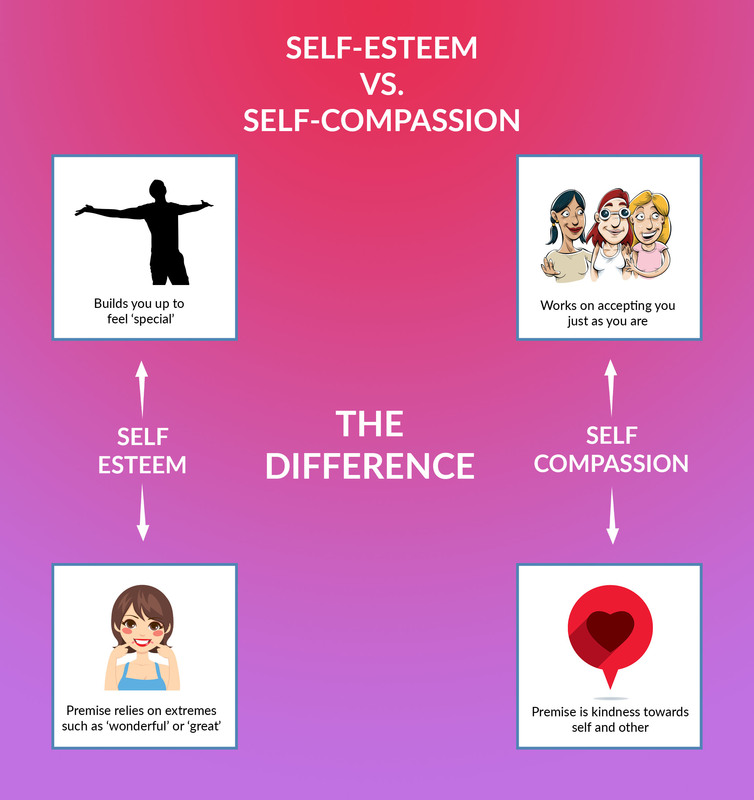 There’s no comparison in self-compassion so the way you feel about yourself doesn’t depend on how you measure up compared to others or a past version of yourself. You don’t need to hide your flaws or be ashamed of them– you can be without anxiety about imperfection and still cultivate self-compassion. Being kind to yourself is a reliable, constructive exercise that doesn’t depend on outer circumstances; and research has shown that this kind of activity is far more useful than building self-worth, because it’s realistic and it makes you more compassionate towards others. Self-compassion is all about recognising that every sentient being on the planet deserves kindness and respect. On the other hand, self-esteem is not a ‘dirty word’. It’s okay to like yourself – but you don’t need to go to extremes either. The middle way is always best. If you would like to learn how to feel good about yourself contact me here for more information.